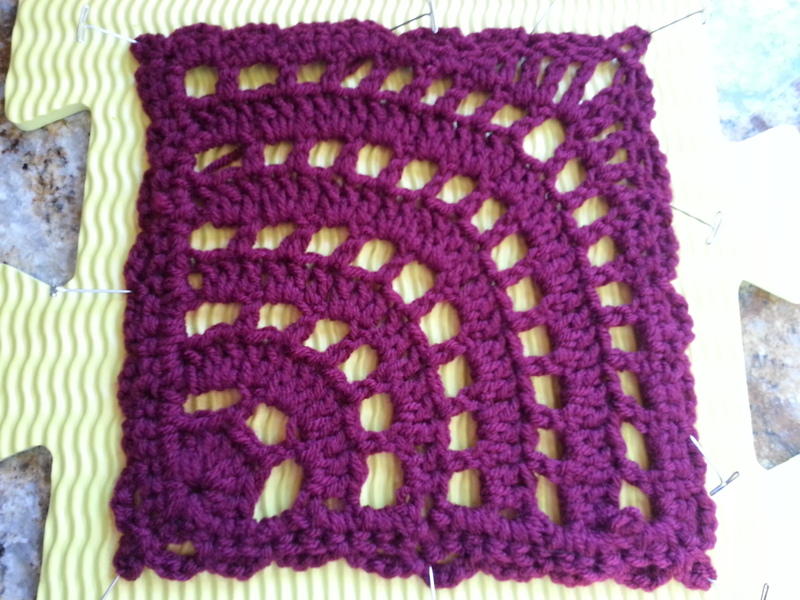 Welcome to WIP Wednesday – which has apparently slipped to Thursday again this week. The reason (excuse) is Wednesday was my middle son’s birthday and went out to dinner to celebrate. By the time I got home, I vegged in the chair without even opening my computer. Maybe it was the delicious Chinese food we had for dinner or maybe not, but whatever the reason, here I am now. 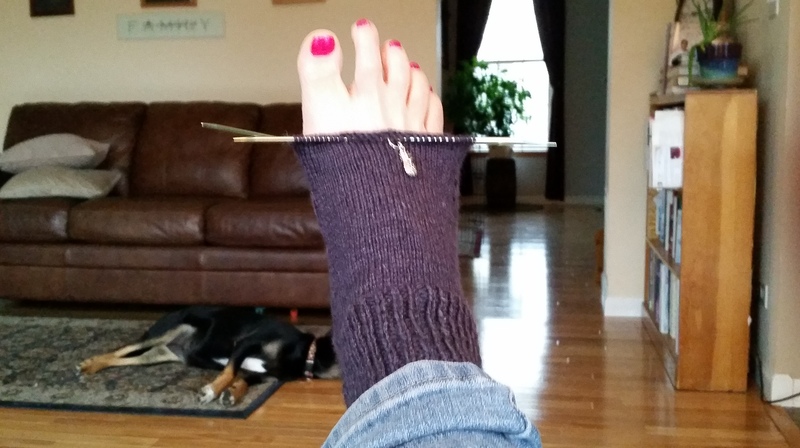 This week I completed my first sock and promptly sealed it in a ziploc bag with the yarn, instructions/notes and needles so I can pick it up the next time I travel. Which I hope is soon. But mostly for the travel, not the sock, which won’t be needed until fall when it gets cold enough to wear my boots again. The good news is I got about 1/2 to 2/3 done on the baby afghan for the gal at work. The bad news is she told me on Monday that her friend had a girl, not a boy like she anticipated. Hum, before ordering a blue and yellow blanket would you make sure said child is going to be a boy or get a more gender neutral color ordered? She suggested just “adding a few rows of pink”. Nope, can’t have anyone think that was MY choice. So over to Hobby Lobby with the hubby Tuesday night to get a wonderful baby pink color. I’ve just discovered “I Love This Yarn” that comes in a 7 oz skein of acrylic worsted weight for only $3.99 each. It is really nice yarn, soft, yet sturdy enough to show the stitches nicely. It isn’t as soft as Brava from Knit Picks, but is almost 1/2 the price and I don’t have to wait a week for delivery. 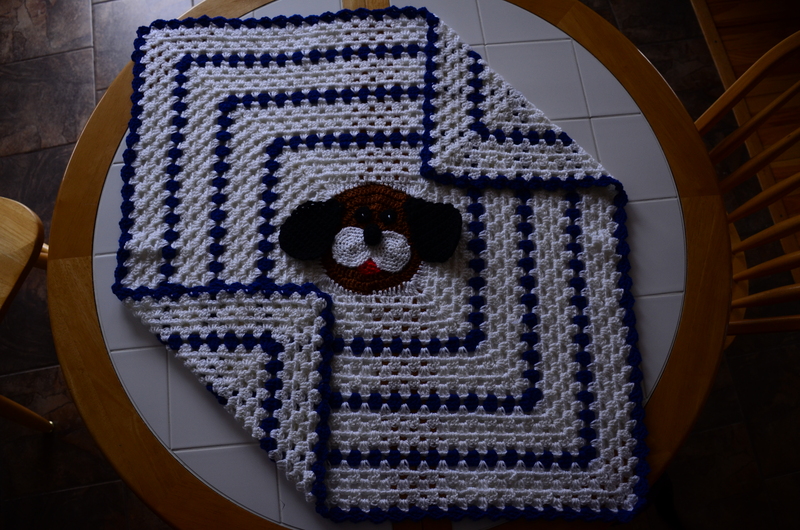 Acrylic is my choice for baby afghans because machine wash and dry is a must for baby items. And I don’t have to worry about wool allergies since I rarely know the recipients. I’m only a few rows in, because break yesterday was nonexistent due to a meeting (what the heck?) and I only got to work on it during lunch. But I think it is cute and very girly. I almost wrote that I should have it done by next week, but we have out of town guests coming in on Friday night, an anniversary party on Saturday and a BBQ on Sunday. Soooooo, not much time to crochet. I’ll be conservative and predict I’ll be 1/3 – 1/2 done by next Wednesday and hopefully be further along. Regarding the blue and yellow blanket. I am not tearing it out, because I think it is really cute and I am already about 6 hours in. I’ll finish it after the pink one and save it for the next baby boy that arrives. So this week the only project I am going to concentrate on is the pink blanket. I’ll let you know how that works out next Wednesday. Or Thursday. LOL And maybe get one of the bear hats going…. I also worked on fusing two tablecloths together. Sounds like an odd task, but let me explain. Back in the 80’s I was a stay at home Mom with 3 little boys. I used to read the magazines I received in the mail from cover to cover soaking in advise, tips and recipes. I read about starting a family tradition of signing a white table cloth on each holiday, then stitching the names to create a family heirloom of sorts. It seemed like a great idea until the stitching took longer than anticipated. 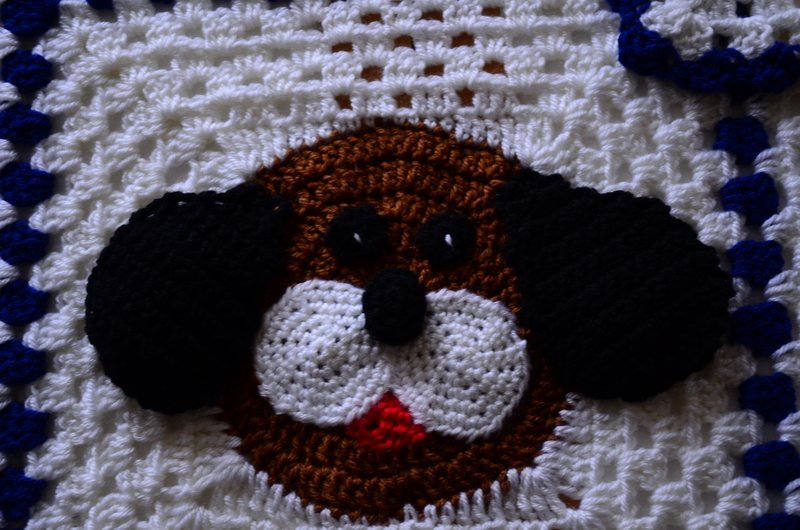 I stitched some, my grandma stitched some, my aunt stitched some – and we still couldn’t keep up! So we switched to fabric paint. This was a good idea – or so we thought, until it started to flake off in the washing process (we actually eat with it on the table at all holidays) so we had to go to plan “C”. Now I purchase colorful Sharpie markers so that problem has been solved. Until….the younger generation started lobbying for a new tablecloth. All of the ex-girlfriends and a couple of ex-husbands were a point of contention. 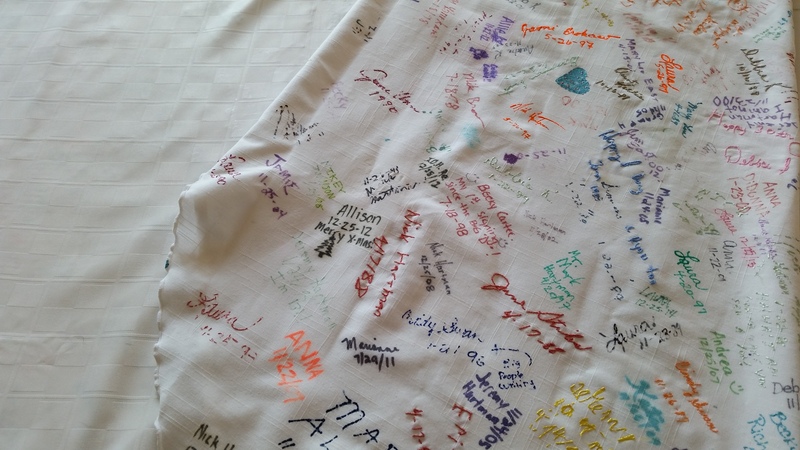 I was not willing to retire the tablecloth with the signatures of loved ones that are no longer with us. My grandma, mom, aunt and mother-in-law to name a few as well as the adorable signatures of the kids as they learned to print then write. So my plan was formed to make everyone as happy as I could. I purchased a second tablecloth, fused them together and will (hopefully before the next holiday) stitch a border on to even up the edges and secure the new side with the old side. Here is the pick I sent all the “youngsters” in the family to show them I was listening 🙂 They all seemed happy with the compromise. The last thing I worked on this week was SOAP! 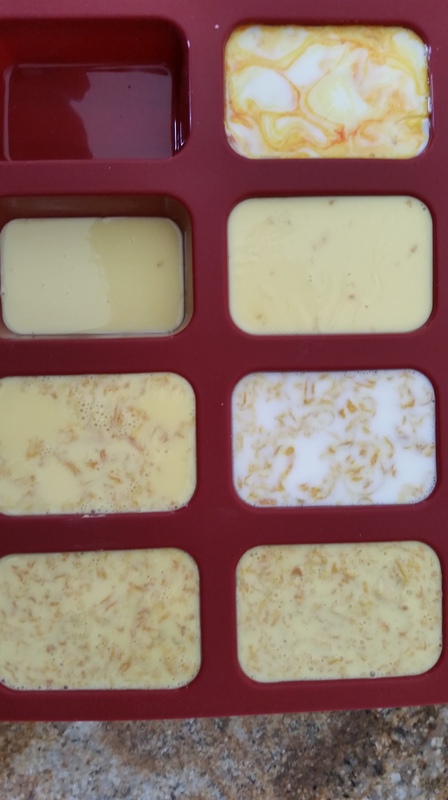 I have been lusting after all of the beautiful soaps on Pinterest. My board Suds and Scrubs has tons of pins, I am obsessed. 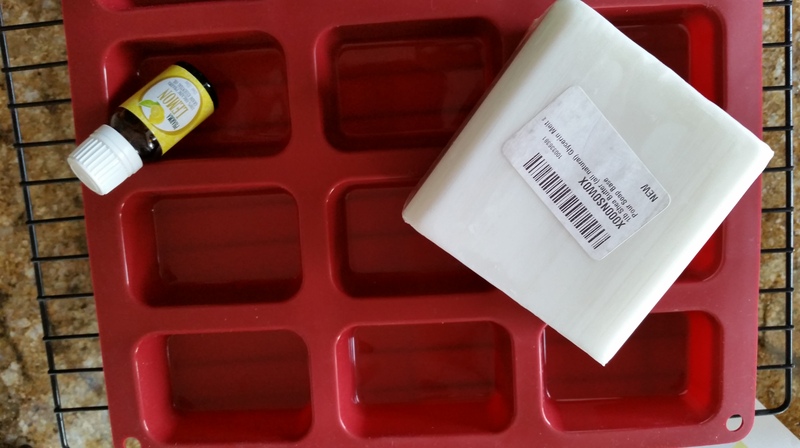 My friend Leslie got me the supplies I needed to make a simple batch of lemon soap for my birthday last week and I was dying to try it. 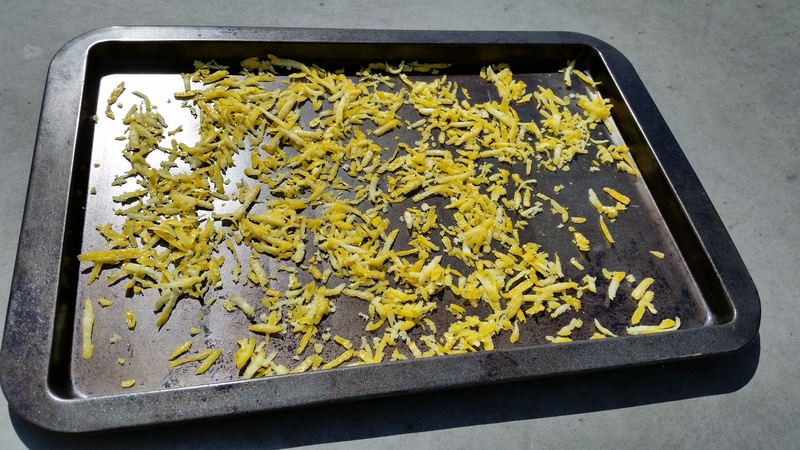 The first thing that needed to be done was dry shredded lemon peels. I now have 4 naked lemons in my fridge, but the peels were fabulously fragrant after drying in the sun. 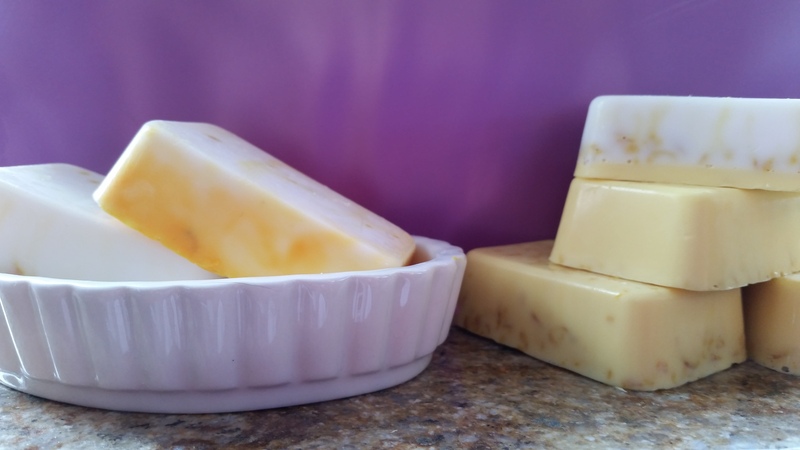 The recipe was amazingly easy, soap base, essential oil, lemon peel and food coloring (note to self – one teeny speck of food coloring is more than enough). This was a super way to begin as it was easy and pretty fool proof . I made it in 2 batches, one with food coloring, one without. Now for the irons I have in the fire. The second sock is a given. I signed up for the Spring NICU challenge, so I have newborn size baby hats to make. Read more about it here: http://www.sunsetfamilyliving.com/spring-2015-nicu-challenge-join/ I am not too concerned about getting them done, since I’ve already donated the 20 bunny hats this month, but want to complete at least 10 more. The nurse I know that works in the NICU I donate to said everyone fights over the bear hats, so I think I will focus on them. 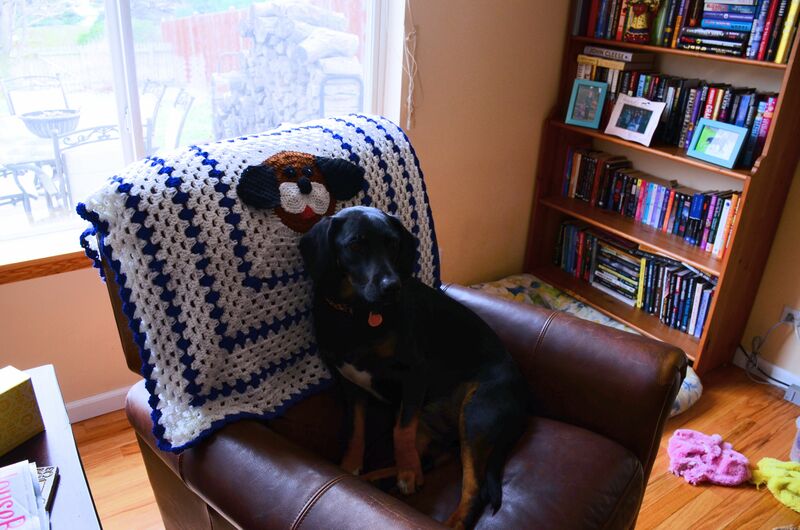 Lastly, the gal at work that I just finished the baby afghan for in February needs another one. I swear everyone she knows must be pregnant – with boys!!! I don’t know how happy she is going to be that I have to charge her more than I have been. I have been only a few dollars over the cost of the yarn, and honestly need to have a bit for all the hours involved. So I got an email from KnitPicks today offering up to 40% off of sock yarns. I’d have to be crazy to order more sock yarn when I have enough to make a dozen pair in my stash. Yet – what harm is it to look…. 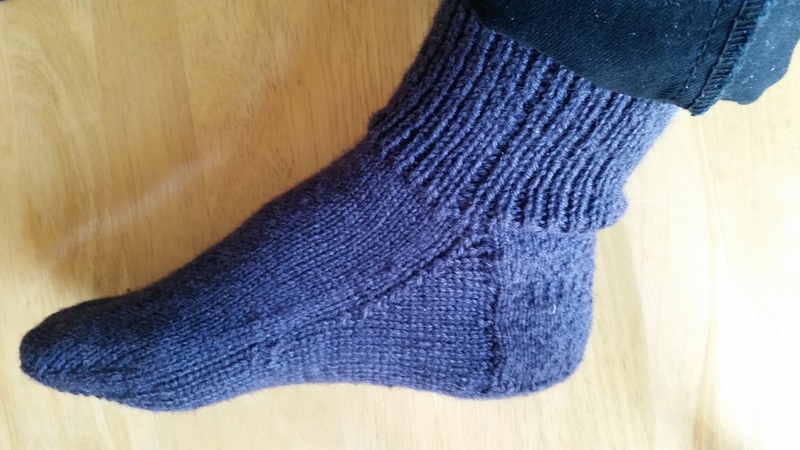 a quick look at sock yarn proved I do have a bit of will power left. Unfortunately, they had other yarns on sale also. Even though my stash overfloweth, I absolutely, positively do not have enough baby blue in the entire closet to make the 2 baby afghans I need to have completed by September. And, in my own defense, the new Brava acrylic is super soft and great to work with. It’s only $2.99 a 100 gram ball and since I need it, I may as well order enough for 2 blankets and get started. That brings me to my next problem. If I spend $50 I get free shipping. Hum, pay about $10 to ship or spend the same amount of money and get more yarn? Who, I ask you, WHO would NOT get the extra yarn??? Besides, they have a beautiful Chroma on clearance – it would make a yummy scarf or shawl…..
Ok, I’ll admit it. 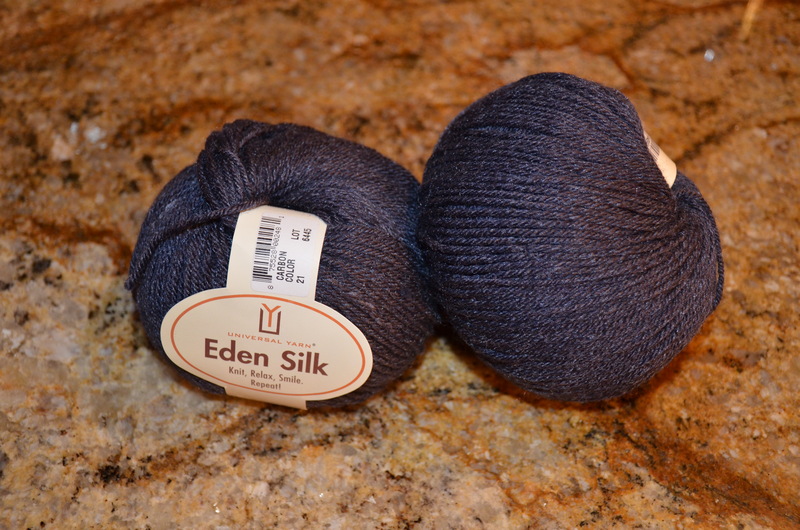 I love to buy yarn, work with yarn, give gifts made of yarn – I’m a Fiber Freak. There, now that it is in the open, I feel much, much better. But just because I am a Fiber Freak, that does not mean I am not productive – it just means I’ll have enough yarn to work with when I retire in 10 years or so without worrying. I’ll stash shop. Meanwhile, I have a few projects that need to be completed before the snow flies. Or at least before Santa leaves the North Pole this year. To keep me honest, I’ll list them below and give you all updates once a week or so. 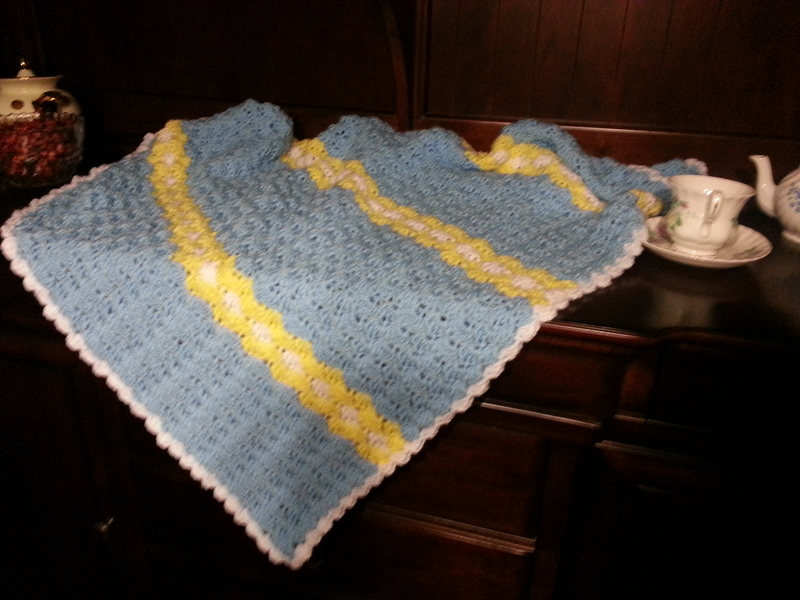 2 Baby boy afghans – both need to be completed by early fall, so more than likely I will crochet them as I can do that faster with a shell pattern that looks more complicated than it really is. Pr socks – to win a bet that I wouldn’t make 3 pr this year. Hat – made from the super soft alpaca I bought on vacation in Oregon this spring – for me! Shawl – this is dicey – if you’ve been following my blog, I’ve been messing around with this shawl for over a month. Still not all that happy, but will try and carry on.